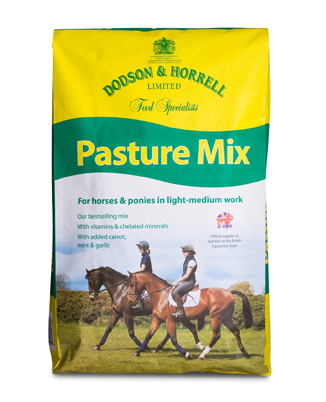 Pasture Mix is Britain’s favourite, original oat free coarse mix, formulated to give your horse sparkle, but without the fizz. Specifically formulated for horses and ponies in light to medium work, Pasture Mix is packed full of vitamins and minerals, quality protein and antioxidants to keep your active, working horse healthy and in optimum condition. The carrots and herbs in our Pasture Mix provide a delicious addition for your horse or pony. Feed 600g/100kg bodyweight per day to horses and ponies. For example, feed a 350kg pony 2.1kg per day and feed a 500kg sports horse 3.0kg per day.